Walking, Jogging and Bicycling are not only good for the body but they also contribute to your mental health as well. They help the body get rid of triglycerides and also trigger the production of several key chemicals that help to enhance your mood. Our bodies were designed to move and quite often, we were designed to be both hunters and gatherers which before the modern world appeared helped us to keep healthy. Now with T.V. and computers occupying most of our free time and our jobs becoming less and less of a physical workout we seem to be putting on the pounds which promotes the decline in our health. Since for most of us the hunting gathering days are behind us we need to take time from our T.V. and other modern conveniences to go out and do something both fun and healthy. You can get exercise from many fun activities such as playing basketball, baseball or even playing tag with your children. 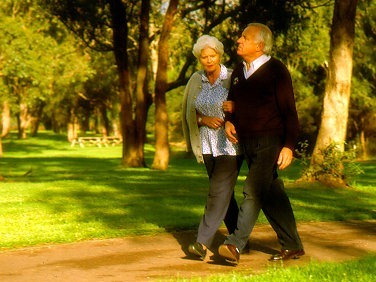 Walking is one of the best forms of exercise since its low impact and you can start at the lowest pace. Even slow paced walking is beneficial and now studies show you can walk or jog in small 15 minute intervals two to three times a day and still get the same result as if you did it all in one session. I myself find walking very therapeutic and quite calming for my nerves and mind. While walking I tend to dwell on the problems of the day to start with and work them out then I clear my mind and focus on the scenery. By the time my walk is over I don’t feel all the stress I felt before the walk. Some of that is due to the chemicals the body creates during exercise and the rest is due to the fact I am able to let go of my problems during the walk. I believe walking is similar to Tai Chi in the sense it can be a type of moving meditation if one desires. Tai Chi is also a good form of exercise and has proven to be beneficial to your muscle and joint health and calming to the mind. Try to find a physical activity that is fun to do and you will find a happier and healthier you. Get up and get outside so you can enjoy life.